Surprise - another Mexican post! But this post features what I was hoping to find in Mexican cooking - something other than what you see at your typical Americanized Mexican restaurant. Something other than what most people think of when they describe Mexican food. I was browsing the Mexican section on the Epicurious a few weeks ago when I came across this recipe for Beef with Three-Chile Butter. I saved it to my recipe box until last night. The recipe called for dried ancho chilies and dried guajillo chilies, which I found in a Mexican market. 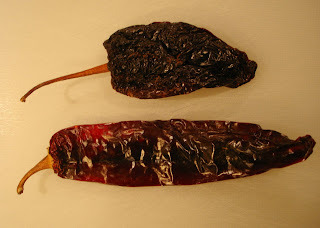 In the picture below, the ancho, a dried poblano, is on top, and the guajillo is on the bottom. 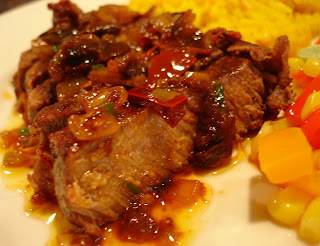 This recipe was based on using a beef tenderloin roast. Since it was just the two of us, I used 2 filet mignons and cut the recipe for the sauce in half. Heat large skillet over medium-high heat. Add guajillo and ancho chile slices. Toast until fragrant and beginning to darken, stirring often, about 30 seconds. Add butter, shallots, and chipotle chiles. Stir just until chiles are coated with butter and shallots begin to soften, about 2 minutes. 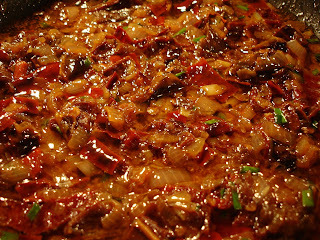 Add 1 cup water and simmer until dried chiles are soft and all water has evaporated, about 15 minutes. Mix in chives; season with salt. This has to be one of the best recipes I have tried recently. The sauce was not spicy at all - it had depth and fullness but did not overpower the filet (sounds like I am describing a wine!). And for how simple it was to make, I was extremely impressed. I sauteed veggies to have with our steaks. Simple and colorful - 1 red pepper, 1 orange pepper, and 1/2 bag of frozen succotash (corn and lima beans). After heating 1 tablespoon of olive oil in a pan I added the peppers and some Kosher salt. 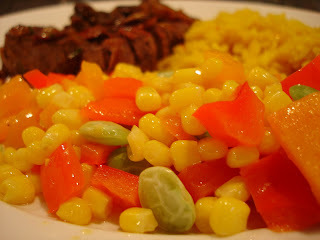 5 minutes later I added the frozen corn and lima beans and sauteed for 2 minutes. Aren't they so pretty? I love adding color to my plate. It's really interesting Mexican food (and the view isn't half bad either)... dishes you'd never expect. Check out the menu! that butter sounds amazing! Oh, how I miss a good steak!